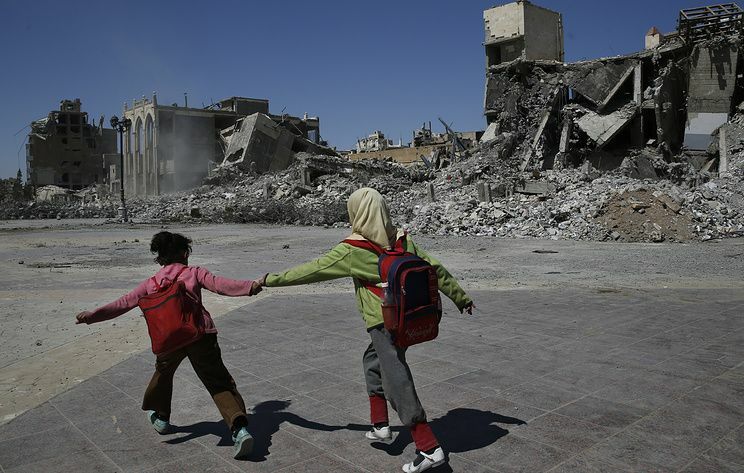 The US-led coalition’s actions in Syria’s Raqqa are seen in Damascus as genocide, SANA news agency said on Sunday citing an official source at the Syrian foreign ministry. "The entire world has witnessed the systematic destruction of Raqqa city by the so-called international coalition and the rotten bodies of innocent civilians in the streets of the city and the displacement of the rest of its inhabitants which amounts to crimes of genocide that require accountability," the foreign ministry official was quoted as saying. According to the source, at this very time the coalition opened "safe corridors" to evacuate Islamic State (a terrorist organization outlawed in Russia) terrorists "to use them elsewhere in order to complicate the crisis in Syria and prolong it to serve the agendas of the colonial West." The statement followed the French foreign ministry’s congratulatory message of October 17 on the anniversary of Raqqa’s liberation. The Syrian foreign ministry source stressed that France’s actions within the international coalition are "a shame for France" and are a reminder of "its colonialist history which is full of crimes against the peoples." The situation in Raqqa, which is controlled by the US-led coalition, remains tense. According to the United Nations assessment mission, 80% of buildings in Raqqa are either ruined or damaged, with dead bodies staying under the debris. People are dying because the city has not been cleared of mines. The city is cut of electricity and water supplies. Schools and hospitals are closed.